This isn’t a recipe at all but I felt I needed to share this moment with you. I came across something I hadn’t eaten before right here in old blighty, in fact in the local town. Walking through town to post a letter one day, I noticed a new green grocer had opened up. 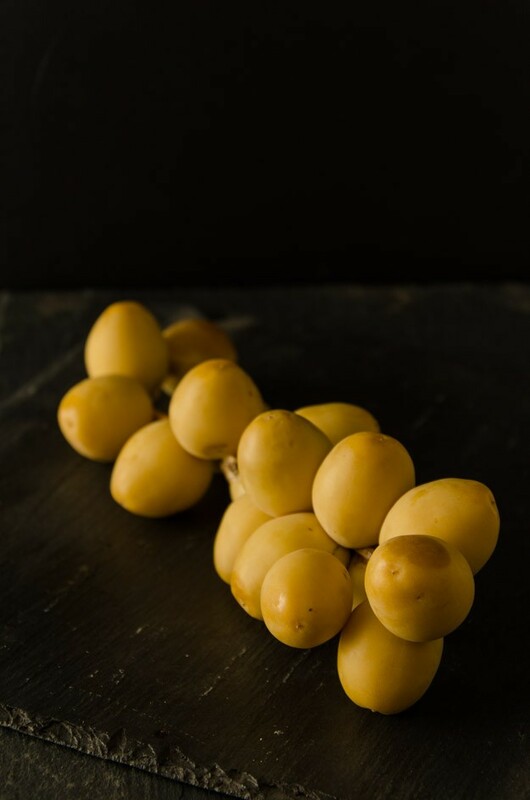 There was an eye catching display of veggies in boxes outside in the late afternoon Autumnal sunshine but what caught my eye was these; fresh dates, also know as Barhi. Barhi are an Arabic delicacy, typically eaten during Ramadan. Now, as far as I remember Ramadan typically falls in August so I don’t know if anyone would be buying them in October, but I did. I enjoyed eating them and I am glad for the experience to do so without travelling to exotic lands, but to be honest I don’t think I’ll bother again. When bitten into they are surprisingly crunchy like a good apple and immediately intense sweetness fills the mouth. But afterwards they have an astringency which I can best describe as biting into a seriously under-ripe banana. Perhaps once tried is enough for these.